Boat interiors 2. – Dirty wet dog , boats and sailing. For the second in my series of boat interiors blogs i had intended to cover my own little boat (Hunter Liberty) , how i have modified it as best i can to be as functional a very small boat interior as possible but having just seen 2 new boats i thought i would talk about them instead. Because of circumstances here i brought forward my project to see a series of potential new boats from an autumn job to a summer holiday job and don’t worry we did also have a good holiday while seeing boats : in fact viewing boats only took a few hours out of the 10 days although the driving was painful to say the least ! Of the boats that i wanted to get a first look at i did get to see 2 out of my intended 5 although 2 of those are keel variants of one boat rather than different boats : the 2 boats that we did see were the trailer-sailer Dehler 25 and the larger GK29 which i saw as a potential long term offshore orientated cruising boat. Both boats are ‘fails’ at this stage and in each of them it was the interior layout that was part of my decision against them. Having posted briefly about the Dehler 25 (Red Rum) already i will start off by talking more about the larger GK29 which i have seen touted in the yachting press as a good ‘small’ cruising boat….small ? obviously the yachting press are a bit out of touch with reality and real small boats. Anyway i was thinking about a project that would start with GK29 and create a long term cruising boat out of one as they have a good reputation as a solid and capable offshore boat : my tentative plan included a new proper shallow draught keel , either Scheel or Warwick-Collins type and a reversion to simple hanked sails and similar deck gear. The boat should work well for a couple as theoretically its got enough interior volume to have an in-harbour double berth forward, at-sea settee berths in the main cabin and at least one quarter berth. The boat is wide and deep too so there should be enough stowage space. Once again i have borrowed this picture of the production cruiser-racer version. The actual boat we saw was ashore on props in a boatyard just outside Portsmouth and the broker very kindly arranged with the yard office for us to have access to late in the day after a long drive from Essex. It felt very familar putting a long ladder up against this boat just like the many IOR boats that i used to work on and sail : with some 5 feet of draught and quite high ‘boxy’ sides the deck feels a long way from the ground especially on props. Its a very wide boat on deck with a wide and open cockpit and a nearly flush deck which is something i do like for working on but it does mean that there is a long step down into the boat, i fact it feels like a long way down to climb down into the cabin. The point of maximum beam is in fact just forward of the galley on one side and a forward facing chart table opposite, then there is a settee berth each side with a table in centre and then the main bulkhead which i think is non structural as there is both a steel compression post for the mast and a pair of tie-bars from the shroud plates down to hull webs. Forward of the main bulkhead is a small heads to port and an open locker to stbd and then a double berth in the forepeak. Aft is very much closed off with the galley one side, an engine compartment under the pit and a quarter berth aft of a small chart table. In a way this is a fairly typical cruiser-racer interior of its era and not unlike many boats that i raced offshore in fact thinking back this is quite like the OOD34 and Sigma : obviously longer boats but not much wider. On the OOD34 i seem to remember that the first things we did were to take the main bulkhead door off and the table out to create useful space inside that we could actually move around for jobs like packing the spinnakers. In the GK the spaces felt surprisingly cramped and awkward, i found it difficult to move around the table and had real difficulty getting into the quarter berth. A real problem was getting into the heads and shutting the door and an even more awkward problem was getting into the forward vee berth which seemed un-necasarily high. The galley was just about the only individual space that seemed to work. 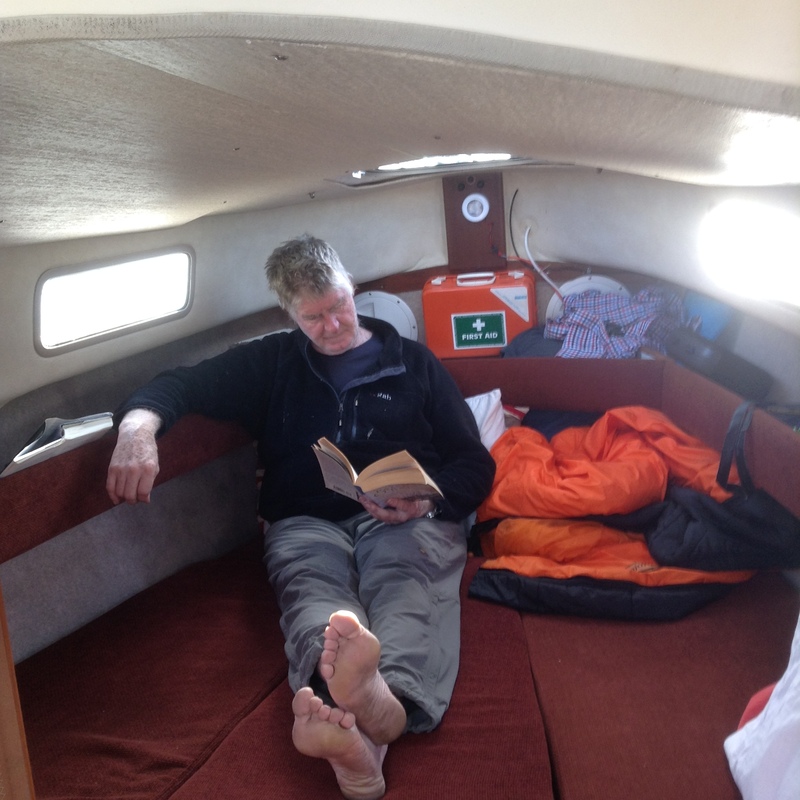 The worst aspect of the boat is that with the flush deck it felt like being down inside a box-cave with no view out. I have to admit that the actual boat we saw really put me off for its horribly familar stench inside….very bilge-y and stale : just looking inside the lockers showed how much the boat desperately needs emptying out and washing right out. That of course is something i could fix in a day or 2 but to make the interior work would i feel need some major work inside. In reality the actual boat would be quickly outside my budget as even a quick look at the sails showed me that all of them need replacing so that’s at least 5 new sails to start with and that is after having a new keel designed an cast. Its the interior though as much as anything that put me off…maybe the full race interior version is better but on this one the interior seemed less effective that my previous boat which was some 3 feet shorter and a couple at least narrower. For a high volume hull it all seemed cramped and awkward and not an enjoyable space to live inside for weeks/months at a time. The actual interior i have in mind is one that was done by a bloke called Danny Greene and its essentially open plan with a simple modular structure in ply/glass for things like the galley. The main living space is formed as a large central cushionned area that can be sat on/layed around on just about anywhere. Trying to find pictures of that boat to show what i mean. Peter Cash’s comment from 0/3 is relevant here : “I recall the Danny Greene boat, modular interior that all came out through the hatch. We were finishing our 31′ steel yawl at the time, but went for a more trad look and build. His layout was simple but did not fit our family plans with kids. My wife wanted a full galley and private head and a kiddy cabin. The worked ok though at 6′ would not fit now..
Peter Cash wrote : “The Cruising world link on previous post will work. Scroll up to the article Living with steel. Good shot of the moduler interior bits on the dock. Yes it was definitely Brazen and Danny Greene that i was thinking about, my plan with the GK , after some cruising to see if i could live with the boat, was to do an interior refit along those lines mainly by creating a ‘plane’ through the centre of the boat that would be treated just the same as Brazen. The forepeak was to be an open space with rails to hang lines and fenders. The cockpit locker would be sealed allowing 2 quarter berths. Most of the stowage would then be in sections below the plane of the central sitting/lounging area. I am working on a similar idea for the potential Sadler project as that basic idea is how i have the interior on the little Liberty which has taught me a lot about small boat interiors. The Cruising world link on previous post will work. Scroll up to the article Living with steel. Good shot of the moduler interior bits on the dock.